The present-day University of Minnesota, Morris (UMM) campus was founded in 1960 as a public liberal arts institution. The campus that UMM would be inhabiting, however, had a much longer history. 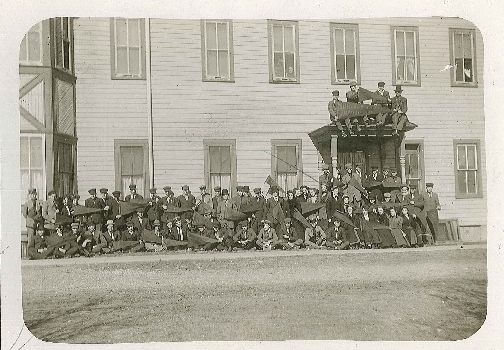 The first institution to occupy the current UMM campus was the America Indian boarding school established by The Sisters of Mercy in the late 1880s; transferred to the federal government in 1896, it’s official name became the Morris Indian School. It remained in existence until 1909, when its doors were closed due to a change in policy regarding government funding. The grounds were then turned over to the State of Minnesota to function as an agricultural school.1Steven Granger, “Historic Buildings of the West Central School of Agriculutre Converted to Use by the University of Minnesota, Morris in 1960,” University of Minnesota, Morris, Plant Services (1998), 2-3. The West Central School of Agricultural (WCSA), a three-year alternative to a traditional high school, opened its doors for the first time in the fall of 1910. Only four short years later, in July of 1914, war was declared in Europe; the United States would enter the war three years after that. The West Central School of Agriculture’s Great War story is significant for understanding the history of the school itself and the greater Morris community; however, to fully comprehend the WCSA’s place during the Great War, an examination of the way the WCSA built itself up as a campus in its earliest years is of particular importance. The WCSA underwent a period of immense growth during the nineteen teens. With this in mind, an examination of the West Central School of Agriculture during The Great War Period is also an examination of the school’s evolution from a small, poorly equipped campus to a thoroughly modern educational institution. 1. “West Central School of Agriculture students in front of the old School House,” n.d., Stevens County Historical Society, Morris, Minnesota. 1. ↑ Steven Granger, “Historic Buildings of the West Central School of Agriculutre Converted to Use by the University of Minnesota, Morris in 1960,” University of Minnesota, Morris, Plant Services (1998), 2-3.